Cisco Small Business 250 Series Smart Switches are an ideal solution for any small to medium size business (SMB) seeking a powerful and easy to manage networking solution with a low total cost of ownership! These simple switching solutions are excellent for small offices, branches, and remote locations needing basic connectivity or power over ethernet (PoE) options with flexible wireless connectivity for their desktop and mobile users. 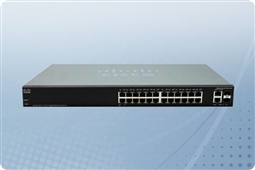 The Cisco 250 Series Smart Switches are also made for seamless and easy deployments with two mode (simple and advanced) graphic user interfaces (GUIs) to reduce the overall time needed for troubleshoot, manage, and deploy the network. Additionally, they are backed by the reliability of Cisco, the global leader in networking solutions for businesses of any size, ensuring the IT Professionals that depend on the Cisco Small Business Series are always able to Get IT Done! Aventis Systems is proud to offer our Cisco Small Business 250 Series Smart Switches all with a 1 Year Standard Comprehensive Warranty with upgrades available to Express Parts Next Business Day Replacement or Extended Term Warranties as well as Onsite Hardware Support Agreements. So please shop our Cisco Small Business 250 Series Smart Switches below and get flexible deployment, easy management, and a low total cost of ownership to help your business the network connectivity it needs today!